There are numerous breeds of cats. There is the Pedigree or pure bred cats (a cat whose ancestry in a recognized breed has been recorded and registered through at least four generations) and the Non Pedigree or the cross bred cats. It was in the 19th century that the first pedigree (with a family lineage) breeds were developed. Among the pedigree ones itself, there are more than 300 breeds and varieties recognised now, with the main distinguishing characteristics being body type- head shape and the length of hair. The latter feature is, perhaps, the most straightforward method of categorising pedigree and non-pedigree cats. 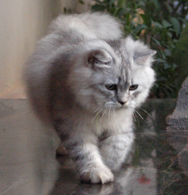 Depending on their length of hair pure bred cats are classified into long hairs, semi long hairs and short hairs. There are two basic body types, one is 'cobby' with a compact sturdy body and a deep chest, broad shoulders and hind quarters, short legs and tail and a short, round head (eg. British short hair and the Persian) and the other non cobby type is slender and lithe with long legs and the head narrow and wedge shaped (eg. the Siamese). There are various intermediate types in between these two extremes. Classification of breeds differ in different countries. The number of cats in particular breeds also varies enormously. Anyone venturing into the pedigree world as a new comer would be well advised to choose one of the older breeds as larger and longer a breed has been established, the more likely it is that any problems have been bred out. There are so many cats varying greatly in appearance and, to some degree, temperament-from which to choose. Some of the breeds and their features are given below. These are the most popular of the long-haired breeds. Persians will happily take to life as indoor cats. They get on well with other cats other animals and children. Persians are tremendously responsive and become a constant source of joy and delight to their owners. Pleasurable as an unexpected sunbeam, their companionship is close and enduring. 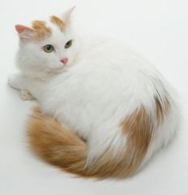 Although independent, the Turkish Van is a feisty feline that is sure to be at home with any family. Their silky, beautiful coats are a pleasure to groom, and their playful love of water provides much entertainment. Known as the Sacred Cat of Burma, Strikingly handsome with its colour point pattern and its pure white toes. 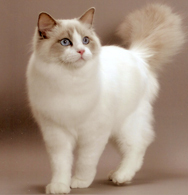 Birman is still a relatively uncommon breed. Sign up to receive monthly e-mail reminders for your flea and heartworm medication. 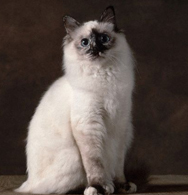 The sweet, devoted personality makes the Birman a terrific companion. Their bobbed tails vary in length; a perfect tail should be long enough to stand up over the cat's back, about 1/3 to 1/2 the length of a full tail. Most breeders will clip the kittens' tails at birth. 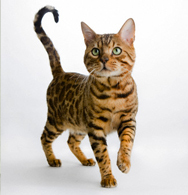 One of the most popular cat breeds. 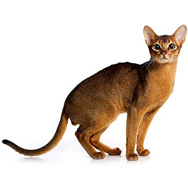 The Abyssinian with a regal bearing, were possibly worshiped by the ancient Egyptians. 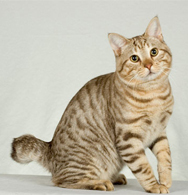 This cat has also gained significant popularity in cat shows, mostly due to its unique ticked coat colors. They usually mix well with children and other pets and like to join in family activities. 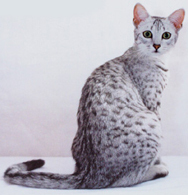 This fascinating cat is the only natural breed of spotted domestic cat. The black and the blue Maus, make excellent pets.